Continuing to push back on negative publicity about its employment practices, Apple unveiled a new webpage Friday to showcase statistics suggesting the company supports more American workers than has been reported. The company claims it is responsible for a total of 514,000 jobs across all 50 states. 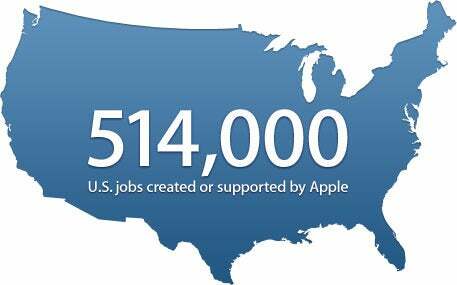 Only 47,000 of those workers are employed directly by Apple. Another 257,000 work at companies that provide manufacturing, sales, delivery, and other support to the company. The remaining 210,000 jobs exist in the so-called “app economy”—the host of third-party software developers who create programs for the iPhone and iPad. Apple's promotion of its domestic job-creation numbers comes after several months of uncharacteristically negative press attention. Much of that attention has focused on China, where Foxconn manufactures iPhones and iPads for worldwide sale; the subcontractor has been accused of providing its employees with low pay and unsafe working conditions. Apple has responded with both criticism of the accusations as well as a renewed commitment to improving conditions for such workers. On its new webpage, Apple says that its 47,000 domestic employees include 27,350 retail workers at the company's 246 U.S. Apple Stores. Most of the workers are full-time, but even part-time workers are eligible for health and stock-purchase benefits. Another 7,700 work as “AppleCare Advisors”—a customer-support workforce that, Apple says, “helps us deliver a better customer experience.” Customer support is one function companies commonly send offshore to save money. The 257,000 “indirect” employees work in businesses that range from the contractors who build and remodel new Apple stores (and the company's new Cupertino campus) to the FedEx and UPS employees who ship and deliver Apple products and Corning workers in New York and Kentucky who help manufacture glass for iOS devices. Apple's numbers come from a private study by Analysis Group, which calculated the company's indirect impact using a federal “multiplier” formula that estimated the total job creation based on Apple's corporate spending on goods and services in 2011. Apple also cited TechNet's February report on the state of the app economy. Apple's corporate image has been riding a roller-coaster recently. The October death of Jobs sparked an unusual outpouring of goodwill toward the company; even Occupy Wall Street protesters took time to mourn the Apple founder. But since then a mini-backlash has been brewing, prompted in part by Walter Isaacson's biography of Jobs (which documented his prickliness) followed by the reporting about Chinese factory conditions.